The second edition of the Polish Sun / Polski Sun is on sale today in advance of the Poland v Austria Euro 2008 match. As before it contains Polish versions of all the features you would expect to find in the English version of the Sun and even contains a Polish page 3 girl! 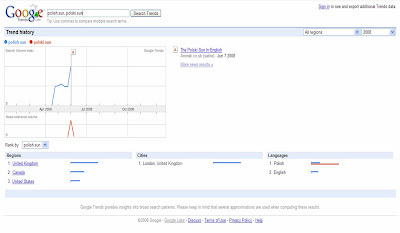 Looking at Google Trends it is possible to see the volume of searches around the term 'Polish Sun' and 'Polski Sun.' The paper is only on sale in Tesco and selected newsagents, but there are a lot of people are looking for more information about the Polish Sun / Polski Sun - against this backdrop the Polish Sun could have a future after the Euro 2008 tournament has finished.